Saaha Offices Block B, Level 3, Unit #304, Old Town Island, MBR Boulevard, Burj Downtown. by electric car: adjacent to Dubai Mall on the Boulevard, enter the Souk Al Bahar lot entrance (BEFORE Cipriani), take the ramp up to Level 3 (Offices & Visitors), and DO NOT ENTER Souk Al Bahar! instead, circle and park near the leftmost side (limegreen row #6). enter through the doors that say “Saaha B” (core B), curve left into the lobby, and Impact Hub will be the office on your right. by footpower: from Dubai Mall Metro Station, take bus F13 and get off at the Palace Hotel stop. walk BEHIND CIPRIANI on through the citadel forts into the large rectangular court. proceeding along the water, a sculpture and Palace Hotel will be facing you; look up at the buildings to your right. when you see the entrance of the second building marked SAAHA OFFICES B, walk right into its entrance. (this will be BEFORE you reach the terraces of La Posteria and Shakespeare). 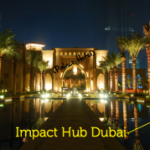 once you go through the doors you will be in a small lobby; Impact Hub is the office on your left. lost? just ask a security guard where SAAHA OFFICES B are. still lost? call us at 04 3754444. still lost? go sip green tea.